Eastman Kodak Co. 1926 Ad. This color 1926 ad states A picture chance and your Brownie gets it. Catching fish, thats fun. Making pictures thats fun too. 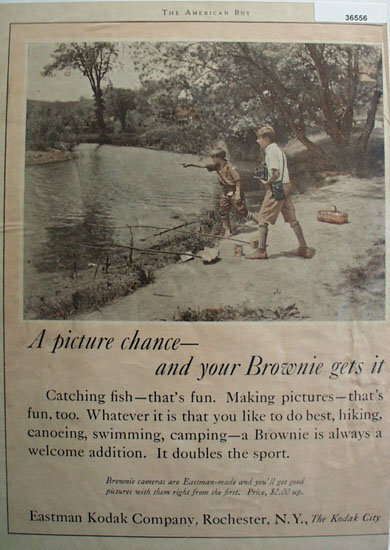 Picture shows two boys by stream, they have their fishing poles set and one boy has Brownie Camera and other boy is showing him something to get picture of. Magazine tear sheet picture is taken through plastic and may show wrinkles or crookedness that is not in the ad. This Original magazine tear sheet measures 9 1/4 inches wide by 13 1/4 inches tall. Items Similar To "Eastman Kodak Co. 1926 Ad"